Feeling the winter blahs? 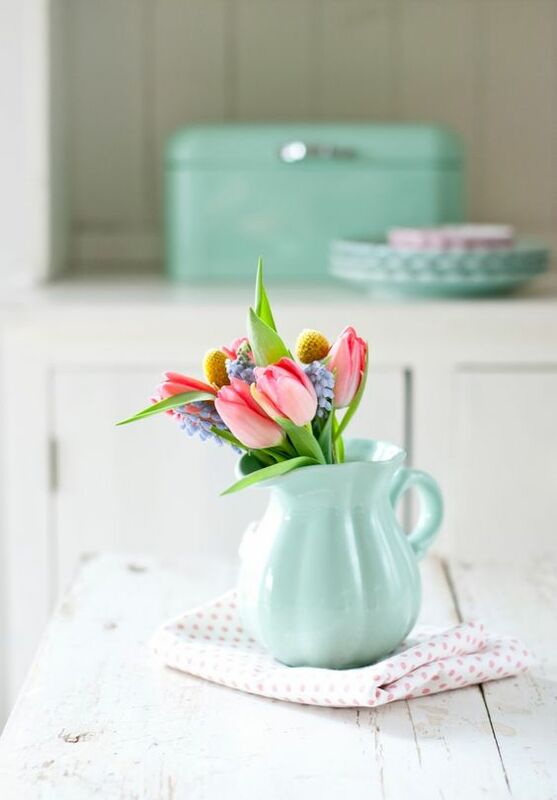 Adding spring color and life to your space is just what you need! 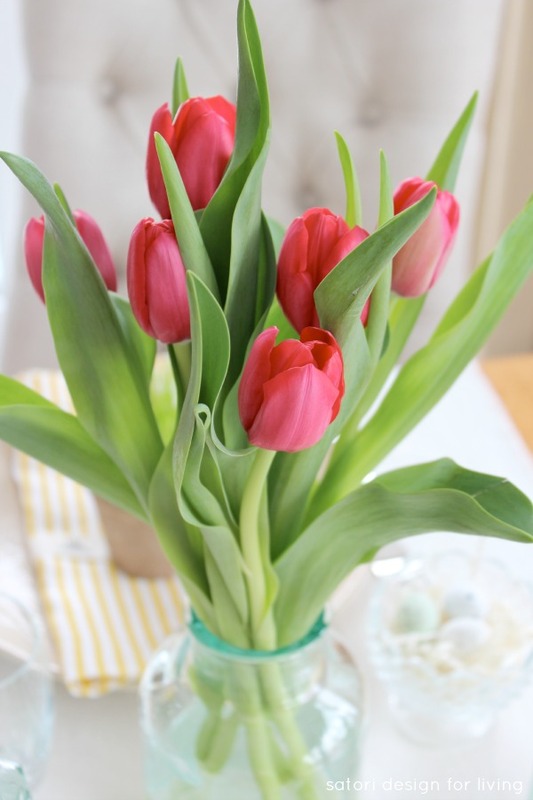 Find out how to force tulip bulbs indoors. I was at the grocery store a couple weeks ago and couldn’t help but notice the loveliness of spring bulbs in the floral department. Throughout the Christmas season, I like to force paperwhite and amaryllis bulbs, and thought I’d give some varieties of tulips a try to keep the color and touch of nature going in our kitchen and dining room. I love how they seem to brighten a dreary winter day. To force your own tulip bulbs, you’ll need bulbs (large and plump are best with no blemishes), well-drained potting mix, containers with drainage holes, and small rocks. Begin by adding a 1-2″ layer of rocks to the bottom of a container and partially fill with potting soil. Next, place the tulip bulbs on the soil surface (pointed side up) and adjust the soil level until the tops of the bulbs are even or slightly below the rim of the container. The bulbs should be close, but not touching. 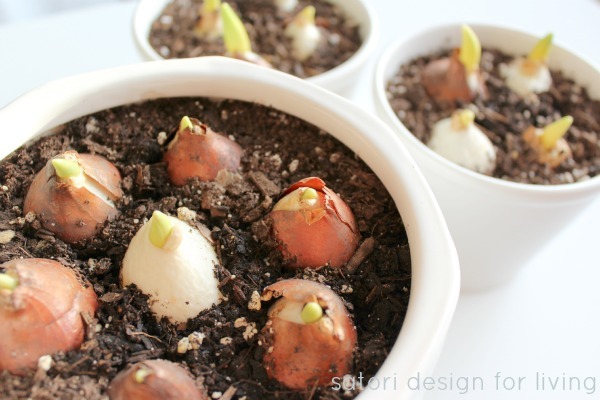 Once in place, continue adding potting soil around the bulbs, allowing the tops to stick out. For ease of watering, the level of the soil should be below the rim of the container. Water each container. In order to bloom, tulips and other spring-flowering bulbs must be exposed to cool temperatures (5-10oC) for 12 weeks or more. Place your pots in a cold area, such as a cellar, an unheated garage or an extra refrigerator. During cold storage, water the bulbs regularly (but sparingly) and keep them in complete darkness (cover loosely if necessary). After the cold requirement has been met and yellow shoots have begun to emerge measuring 1-2″, remove the potted tulip bulbs from cold storage. Fortunately, my bulbs were already starting to form shoots when I purchased them, so the whole process was fast-forwarded. I only had to leave them in cold storage for a couple weeks. Next, place the tulips in a slightly warmer location that receives low to medium light. Leave them in this area until the shoots turn green, around 4 or 5 days, at which time you’ll want to move them to a bright location, but not in direct sunlight. Keep the plants watered, but not too much to avoid rot. Turn the containers regularly to keep the shoots growing upright. Flowering should occur approximately 3 to 4 weeks after the bulbs have been removed from cold storage. If you want blooms throughout spring, plant several pots and remove them from cold storage every 2 weeks. I just pulled out my first one this week and I can’t wait to see what springs up. Until then, I’m admiring this spring arrangement! Is there anything in particular you add to your space to get you through the dreary winter? Tomorrow, I’ll be answering one of the questions posted on Satori’s facebook page. If you’re looking for a quick way to update a space you won’t want to miss it! Great post Shauna~ I’ll have to do something like this! The winter blahs have set in!